The first collection of Wizard of OZ fabrics depicts the beginning of the movie in sepia tones, the panels with Dorothy and Toto are telling the story. In one she is sad and worried that she will lose her beloved Toto and in the other she is singing "Somewhere Over the Rainbow", dreaming of better times and happier days. This is the first one I made for myself and since I wasnt in a Christmas "rush" I took more time and planned a sampler border. 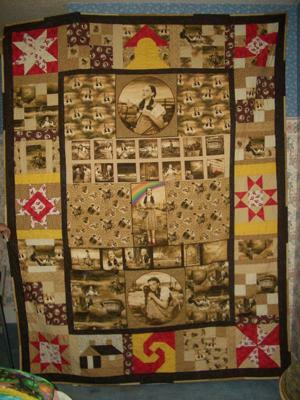 Using the red shoes fabrics on a beige background encouraged me to make the quilt more colorful using the coordinating red and adding accents of the Yellow Brick Road fabric. The monkey wrench block in red and yellow at the center of the bottom row depicts the whirlwind cyclone. The covered bridge block in the top center is laid out to point the way for Dorothy and Toto to find their way to the Yellow Brick Road. As I completed the Under The Rainbow quilt I was planning the next in the series. Over The Rainbow is pictured on a separate page.